In late 2014, Habanos developed the Habanos Añejados (Aged Habanos) series. The cigars in this series are aged in their boxes for five to eight years before release. The boxes are stamped with the original roll date, along with a Revisado stamp to indicate that the cigars have been inspected. These new series cigars carry a second special Habanos Añejados band in addition to their regular brand one. The cigars in this series are made up of unique and discontinued vitolas in global brands. These Montecristo Churchills Añejados, second of the series, were originally rolled in 2008. Lovely looking cigars with a smell of aged tobacco. The second band indicates that you are smoking a special Cuban cigar. As with any aged cigars, the blend has settled and the flavor is more subtle (for those of you used to young cigars, you may find these too mild). We get the spicy, woody Montecristo aromas we all search for in a cigar, but in a more subtle delivery. 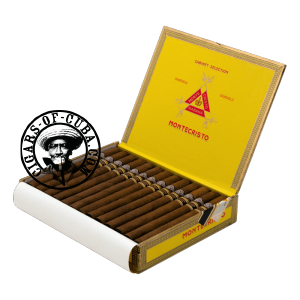 As with all good things, the Montecristo Churchills Añejados production is limited. If you want to experience an aged Cuban without the hassle of going through the aging process, here is your chance.